We have heard that Greece was one of the most interesting countries to visit... Mykonos and Santorini were on top of our bucket list. After planning the trip for almost five months and just returning from it, we can definitely confirm that it is not only interesting but intriguing, full of beauty - people and sights, rich in history and with amazing food. And we only went to Athens, Mykonos and Santorini!!! There’s is so much more to this country, where civilization as we know it had its origins. So how do we capture in a few words and photos the vacation of a lifetime? We simply don’t... But we will try.... We thought of ways to say everything - what we did, what we saw, what we ate, where we stayed, etc... but we will lose your attention by the middle, or even before the middle of the post. So we decided to divided at least in four posts with as much interesting information and beautiful photos as possible. The first one - this one you are reading - will be about basic details of the trip, things you need to know, things we discovered along the way, not by research but by experiencing them. The second, everything about Athens... Then Mykonos and finally Santorini. You can do so much research and plan your vacation and as soon as you arrive to your destination, you might probably throw your plans away and just live moment to moment and get lost in what the destination has to offer. We did just that... Not saying that all the research was a waste of time, it definitely help, and actually, we should have done more and come even more prepared. Why? Because you are never prepared for a trip to a place like this. If you are planning to go to Greece, here are some of the things that you need to know in order to have a better plan or to not have a plan at all. Get in shape! Or at least walk an hour three to four times per day and try adding some climbs to your exercise routine. Trust us, there’s a lot of steps, hills and just walking, not only in Athens but in the islands as well. Chose your destinations and explore them with plenty of time. 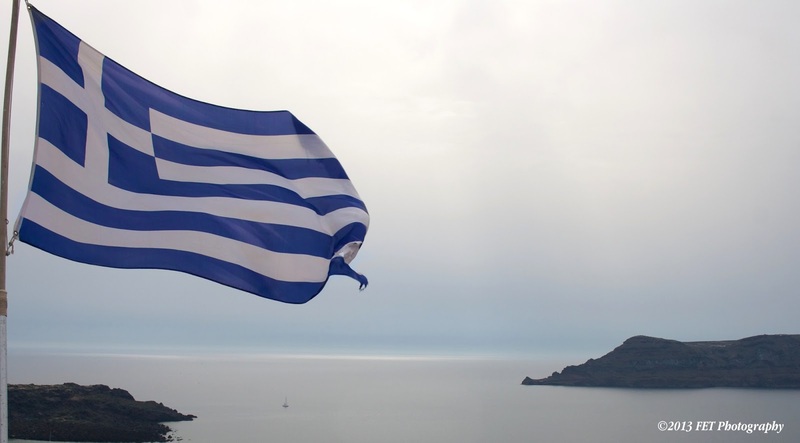 Greece has over 3000 islands and only 130 have people living in them. Mykonos and Santorini are the most known of course and they need to be seen. Our post are going to be more about them since we only had the chance to visit them and Athens. Bring plenty of cash and exchange it at the airport of your trip’s origin. The airports in Greece - as well as the banks - usually won’t give you a good exchange rate. ATM’s are rare in Athens and in Mykonos but there are many in Santorini. They usually give you a good rate when taking the currency in Euros. Why bring so much cash? Isn’t dangerous? Not really. You need cash since lots of restaurants and shops in Athens and Mykonos don’t accept credit cards or money orders. Santorini is more advanced in that sense. There’s plenty to see in Athens, Mykonos and Santorini. So be realist and don’t plan to want to see everything. Chose the things you really want to see and if you have time left, go and see what was left. Even with three nights in each place, we weren’t able to see everything on the ‘must see and do lists’ that everyone recommends. If you arrive in Athens and then move to the islands, don’t take the ferries if there are flights. The ferries change schedules without previous notification, they are crowded and they just take a lot of time. A ferry from Athens to Mykonos can take 4 - 5 hours, when a plane ride is only 25 minutes. We took the Super Jet, an express ferry from Mykonos to Santorini, because it was only two hours but it actually arrived late and we departed 45 minutes later -with a non advised stop in another island (Naxos) - and the total trip was 2 1/2 hours, not counting the delayed time. You won’t miss any views since you will be able to see the sights around the islands so don’t arrive at the ports just because you want to have that experience. Flights are more expensive, but having more time in each island is worth the little extra money that you will spend. As we mentioned in our post about planning the trip a few weeks ago, try to book everything by a local travel agency. We booked a package that included all hotels (with breakfast), transfers from airport to hotel - hotel to airport and/or port - and the local flights and the ferry to Santorini. It was the best thing we could have done. Fantasy Travel, an agency based in Athens www.fantasytravelofgreece.com took care of everything and more. They are reliable and trustworthy. If that doesn’t convince you, if you arrive in Athens, your Fantasy Travel bus will have free wifi!!! The package also included a guided tour of the city of Athens... This you should do on your first or second day in the city so you can see the most important sites - some of them rushed - and then you can chose to go back and explore them on your own. Car, taxis, mottos or 4WD? In Athens, you don’t need to rent a car or motto or a 4 wheel drive. You can easily see the city by just walking around or taking the metro or the bus. We don’t recommend taking a taxi since they tend to get more people in the car even though you don’t the other person or are going to the same destination. So be careful about that. But honestly, we didn’t have the need to take a taxi at all. In Mykonos and Santorini you definitely need to have transportation. If you are alone, a motto or a 4WD will be ok but if you are two or more than two, the best thing is to have a car. Mykonos specifically has a lot of hidden hills and paths that are a little too dangerous to be in a motto. In Santorini the roads are not that good and it will take longer to get to point a to point b if you are not in a car. But be mindful about parking. Both islands have lots of free public parking but they are always full and you will need to park in the ones that are far from where you want to go. If you park in a prohibited zone (they will be marked with a red X in a blue circle sign), the police can take the license plate and you - not the rental car place - will need to pay the expensive fee to retrieve it. If you like to party and are fond of crowds, go to Greece in the summer months (June, July and August). Everyone will be there, clubs will be full, streets as well and you will rub elbows and shoulders with everyone. And they will be sweaty. Summer in Greece is extremely hot. If you want to enjoy the sites and sights with a more relaxed vibe, go in mid May and in mid September. You will find more adults, not that many drinkers and partygoers but you will still have fun and the weather will be better. However, check the weather and dress accordingly. During those months it can be chilly and even rainy. Don’t plan your trip for the months of October through beginning of April since most of the hotels, restaurants and even shops and sites are closed. Mid and end of April are good times to go too but that’s when the Greek Easter takes place so some things might be closed as well due to the important holiday. If you are expecting sandy beaches, Mykonos and Santorini are not the places for you. The sand is more rocky than sandy, it is not soft. So if you don’t like that feeling, wear water shoes to help you enjoy the beach and not even feel the ‘sand’. If you want to shop know that the stores in Athens - at least in May and it September - close early, around 8pm. In summer, they stay open a little later but it all depends on the crowds. If you see something that you like, buy at the moment since you risk the store not being open when you return. Also, if you have read that the souvenirs are more expensive in the islands, especially Santorini, don’t believe it. We bought a few things in Athens thinking that they were going to be cheaper and it was to the contrary... We found the same items - even better ones - way cheaper in Santorini, like 3 or 4 Euros less. So shop wisely. The airports - in Athens and on the islands - have good souvenir prices. However, even if you buy the wine and the olive oil in the duty free shops, they won’t let you get through Greece’s TSA equivalent. So, it is better that you buy anything that is liquid and over 100ml before going to the airports so you can store everything in your bag and not have it taken away by security. Why they even sell it if you can’t take it with you? We have no idea, but the ladies at the duty free store warned us and suggested not to buy anything. And we obliged. Wear lots of sunscreen or sunblock even when it is not sunny. The sun in Greece is tricky and it can easily burn even when you don’t see it. Planning the trip of a lifetime: Greek Islands!!! After months and months of deciding where to go on vacation in 2013, we decided on the number one trip on our bucket list: Greece. Why Greece? Why not!!!!! It is a beautiful and big country with many things to do and places to see. Granted, is a little expensive more than other destinations in Europe but after many hours of research and finding the right way to visit it, it is not that bad after all in terms of money. Key word here is research… We bought the Frommers’ Greek Islands book, read it all and started looking at many different options on how to explore the country and how much each option would cost and set up a budget for our dream vacation. We decided to go to Greece at the end of their first low season (March, April, May). Why? Because it is cheaper, not as crowded as in summer (June, July August) and not that cold as in their fall and winter, when actually most of the restaurants, bars and attractions tend to close. Our first option was taking a Mediterranean cruise. We looked at Royal Caribbean, Costa, Norwegian and many more. We opted for Pullmantur, a Spanish cruise line company (http://www.pullmantur.es/portada.html). Of all of the cruises, they offered the best prices per person (on an ocean view stateroom) and one of the best itineraries. Even though the price included gratuities and even wine and beer and the staff spoke Spanish, we decided not to take it after all. It was a 7-night cruise leaving from Athens and going to Marmaris, Istanbul and Ephesus in Turkey and then Mykonos and Santorini. The times at the Greek Islands were not perfect and we really wanted to see the sunset in both of them and immerse ourselves in the island lives. With the cruise, Pullmantur or others, we couldn’t. So we decided to tour Athens and the islands on our own. But, what if with the crisis in Greece and the strikes, our ferries and flights were canceled and we got stranded in one of the ports??? That was the tricky question. On the Frommer’s book we read that to be safe, one should contact a travel agency in Greece that could make all the arrangements (hotels, transportation, etc) since they would alert us on any cancelations and they will make other plans if we lost a flight or a ferry due to the strikes. And so, we started to look for the best travel agency in Greece that we could fine and that could offer us the best deal. 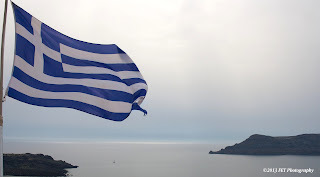 After a lot of research, including multiple visits to the wonderful Matt Barrett website, www.greektravel.com, we decided to contact the Athens-based agency Fantasy Travel (http://www.fantasytravelofgreece.com). They are a fantastic travel agency that answers the most insignificant questions to the relevant ones and in a very prompt way, even with the time difference. Our contact at the agency, Eleni, was very helpful and she recommended the best days, hotels and airfare package that matched our budget and our likes (culture, beach, romance and relaxation). The package includes hotels in Athens, Mykonos and Santorini, all transports from airport to hotel, hotel to airport and/or ports, breakfasts in all hotels and a half day tour of Athens. Eleni was able to give us restaurant recommendations and even things to do while in every city. Her help has been key to developing our itinerary and knowing that she and the agency will be there in case something happens with our flights or ferries, it is a great relieve. We can write much more about the things that we are going to see and do in Greece but this blog post will be extra long. And of course we will do a few posts after our trip, so keep visiting our Facebook page and follow us on Twitter to get photos and check-ins of our vacation. In Athens, ATMs provide good exchange rates so be sure of taking money already in Euros from the ATMs. “I longo for my mofongo”. Guy Fieri couldn’t have said it better. Even though Orlando – after New York – has one of the largest populations of Puerto Ricans outside of Puerto Rico, you would be surprised to know that there aren’t that many Puerto Rican restaurants in the city. There are a few bakeries/cafeterias that serve food, more for breakfast and lunch than dinner. Also a few Latin restaurants that have a mix of Puerto Rican, Dominican, Cuban, Colombian and even Mexican items on their menus. And there are a few other hole in the wall type of places that have Puerto Rican dishes as well. We are going to profile the ones we believe are truly Puerto Rican and serve the best food in Orlando! This little restaurant in East Orlando (Waterford Lakes area) has been bringing to the table delicious and authentic Puerto Rican dishes like mofongo (mashed green plantains with garlic, olive oil and herbs) and pasteles (similar to tamales but better!) for a couple of years to the delight of Puerto Ricans, Latinos and Americans alike. Guavate has a diverse menu that includes a lot of appetizers like alcapurrias, bacalaitos, sorrullitos, etc. (for more info on these, see this post http://www.funeatsandtravels.com/2011/07/frituras-puertorriquenas-greasy-and.html). They also have sandwiches like the famous tripleta (a sandwich with roasted pork, cube steak and ham with potatoes sticks and mayo-ketchup sauce), and Guavate’s tripleta is one of the best that we have had in Orlando. Believe us, we have tasted many. During the weekends, this restaurant is always packed. They are now taking reservations for big groups but to avoid waiting outside, arrive before 12:30pm, especially on Sundays. This is the typical lechonera (they sell pork and lots of it!) or chinchorro (small, simple restaurant with great food and cheap prices) that you will find all over the island Puerto Rico. Is authentic as it can be! They have live music during the weekends; you can find old men playing dominos outside and others having a ‘cervezita’ (beer) looking on. You will find children running around while their parents eat… young, old… everyone goes to this restaurant when homesickness attacks. The sights and sounds captivate but the food will make you feel right at home. From lechón asado (roasted pork) to pernil (baked pork) and pasteles, alcapurrias, mofongos, rice and beans and even cuajito, you will find all the regular Puerto Rican food fixings that you crave and love. Nothing is closer to having a true Puerto Rico experience than Rancho Latino. This is one of the best bakeries in all Central Florida and not only because it is a Latin one. It just is. The bread is made fresh every morning and they have a good selection of baked goods (pastries, donuts, cakes, etc). They open very early in the morning seven days a week and are open for lunch and dinner. But be patient, there is always a line to either order food or to pay and service is usually slow. For breakfast, you have to have one of their many sandwiches and order it with pan sobao (soft and sweet bread), a quesito (cheese filled sweet pastry) and a café con leche (latte). You won’t be disappointed by any of their breakfast offerings. They have many lunch specials during the week that start at $4 and they have good prices overall during the weekends and dinner. They serve everything from rice, beans and pork, mofongos with shrimp and fried pork, beef stewes, yucca al mojo (with garlic and oil) and much more. Go with an appetite because they serve a lot of food but leave the extra cash at home. For $30 a family of four can have a delicious and filling meal. We have to admit that we didn’t like Tropifongo the first time we went there. The food was over seasoned, oily and overpriced. However, we recently gave it another try and we fell in love with the place. It has been renovated and decorated and it is under new administration and we believe, under new chef and cooks. The mofongo is the best. Still made with lots of garlic but the flavor doesn’t diminish the pork cracklings, the mashed green plantain and the olive oil used. The fried pork as well as the fried chicken is tender, flavorful and not greasy. They make one of the best churrascos in town (beef skirt)! With mofongo or with rice and beans, it is delicious. They have hearty soups and stews good enough to revive the dead (literal translation of the saying in Puerto Rico – una buena sopa para revivir hasta los muertos!) as well as other dishes but the best is definitely the mofongo. Remember, these are top places. Be sure to let us know which ones are yours and why! When you are in Miami’s South Beach, the last thing on your mind is ‘where can I find Chicken ‘n Waffles?’ It is beach, mojitos, Cuban food and even sushi. But Southern food? Not really. However, when Yardbird Southern Table & Bar opened its doors in 2011 that totally changed. Now, if you go to South Beach and don’t have chicken ‘n waffles, chicken biscuits, shrimp & grits and macaroni and cheese, you didn’t go to Miami at all. Nested in a residential block near the busy Lincoln Road, Yardbird stands out in a corner with its white walls, black signs and a dozen of cozy seats in the outdoor patio. When you come in, that’s when the magic starts. Hardwood floors, and open kitchen and home-style décor, give you a welcomed feeling… just like if you were entering a house in the south. A house with lots of mason jars, bourbon and bacon, that is! The dishes at Yardbird are meant to be shared, among family and or friends. That’s the southern philosophy after all. And that’s what we did. We met two friends, who actually had recommended the restaurant during our last visit to Miami, on a Sunday for brunch. Reservations are highly suggested; we tried to reserve a table for four with weeks in advance and nothing was available. Don’t be disappointed and don’t change your plans, we arrived early – like 11am and although the wait was around 45 minutes, we found a bar table in less than 10 minutes. And like our waiter said, it was the best and fun table in the whole restaurant. We started with a few mismosas and crafted beers but also ordered a Bloody Mary, that featured a bourbon infused bacon strip (yes, and it was delicious) and one of the many bourbon drinks that they have on their drink menus like the Pick Axe (a Woodford Reserve Bourbon, mint, iced tea and orange syrup). What’s more southern than bourbon and iced tea??? After getting our drinks we order one of the specialties of the restaurant, Mama’s Chicken Biscuits: two delicious and flaky house-made buttermilk biscuits, free range and perfectly fried chicken smothered with pepper jelly. Although we were hungry, the waiter suggested that we ordered only one of them since one was plenty for the four of us to share. And he was right, although after trying them, we were craving for more. They are so good! The biscuits were followed by the crispy Fried Green Tomato BLT. Three chunky fried green tomatoes topped with a house-made pimento cheese spread, Heritage Acres Farm pork belly – cooked to perfection and greens – are accompanied by a sweet tomato jam. It was also the perfect portion for sharing among for people. Our third course was the macaroni and cheese. But this was not your typical mac ‘n cheese. An iron-cast casserole filled with torchio pasta and five artisanal chesses (among them, a creamy Grasyon cheese) and a crispy herb curst, looks small at first glance, but it is good to share too. However, this is perfect for two people rather than four. So if you have a party of four or more, we suggest that you order at least two of this delicious pasta dish. We couldn’t go to Yardbird and not have the Chicken n’ Waffles. To our surprise, they don’t serve this dish during brunch, only for dinner or supper. But be sure to ask your waiter if they can prepare it for you. This is the restaurant’s crown jewel, their signature fried chicken dish. It comes drizzled with a hot sauce honey, a cheddar cheese waffle with a green tomato relish, a side of bourbon maple syrup and a good portion of their refreshing chilled spiced watermelon (with lemon and herbs – like basil). This is definitely a plate meant for sharing, unless you want to have it all to yourself. The chicken is moist, juicy but not greasy. The waffles are sweet as well as the syrup and relish but they don’t over power the flavor of the bird; to the contrary, it is the perfect combination with different profile flavors. There are of course many other southern dishes for Sunday brunch, lunch and dinner. There are plenty of eggs, ducks, bacon, and bourbon to last you a few months or weeks until your next visit to the South, South Beach. When thinking of celebrities, film and TV starts, almost everyone dreams about going to Los Angeles and Hollywood. Those cities in fact are the best known but there is another city, very small in comparison, which is the actual “Media Capital of the World”: Burbank. Yes, Burbank. That’s where all of the big studios are, where the production and filming of big TV shows and films happens. The city is so close to Los Angeles (only 12 miles to the north) and a few miles north of Hollywood that it is easily overlooked. We are suckers for TV shows and films, so Burbank is a paradisiacal city for us… it is a quick trip if you are in the LA area… but there are lots to do. A visit to the city has to include a stop at the Warner Bros. Studios, where current shows like Pretty Little Liars, 2Broke Girls, Ellen, The Voice, Mike & Molly and more are taped. Older shows include ER and the most famous of all, Friends. The tour takes you to the famous coffee shop, Central Perk, where Phoebe, Rachel, Monica, Joey, Chandler and Ross had their coffee and more. If you are lucky and carefully looking, you might spot a few actors roaming around and getting ready for work. During our visit we spotted David Arquette!!! The tour guide mentioned that Ben Affleck was around there shooting extra scenes for his little movie that could, Argo. But sadly, we didn’t see him. The headquarters for the international company are in fact the only major studio that doesn’t offer a backlot tour for the general public. But here are some of the things that are inside one of the most ‘secret’ production location that was born in the late 1930’s and remodeled in 1986. The Disney Legends Plaza – located between Team Disney (corporate offices of the company’s CEO and boardroom of the Board of Directors; it is also called The Michael D. Eisner building and the Seven Dwarfs building as it has the seven dwarfs from Snow White ‘holding’ the roof of the building) and the Frank G. Wells building, pays homage to the recipients of the Disney Legends awards. It features the popular Partners statue of Walt and Mickey and one of Roy Disney and Minnie… both can be found at Magic Kingdom in Orlando. At the plaza you can see bronze plaques of the award recipients like animator and Imagineer Ward Kimball. The Frank G. Wells building is home of an underground parking lot and the home of the famous Walt Disney Archives as well as offices and most importantly the home of the Multiplane Camera, an animation camera that was created by the Disney Company to do Snow White and the Seven Dwarfs in 1937. The building also has a Starbucks! Other buildings are the Animation Building; The Roy O. Disney Building – office for Roy and now home for many corporate offices; The Fantasia Stage (Stage 1) – the original Disney soundstage; The Julie Andrews Stage (Stage 2) – is the second oldest soundstage in the lot and one of the largest in LA where the first series of The Mickey Mouse Club was shot as well as Mary Poppins and The Princess Diaries, therefore the name of Julie Andrews, star of both films; Stage 3 – that was designed for the film 20,000 Leagues Under the Sea, it has an operational water tank for water effects; Stages 4 &5 – used for a lot of TV shows; Stages 6 & 7 – soundstages for the Studios and last but not least, the ABC Studios Building – corporate offices for everything related to ABC (American Broadcasting Company) including its ABC Studios and also offices for the Walt Disney Studios Motion Pictures. There’s a lot more in Burbank of course… and you walk around the residential area of the city, almost everyone that you will see/meet is an employee of the industry and work in the area. There aren’t a lot of good and known restaurants in the area since most of the studios have their own cafeterias and use a lot of catering companies. However, if you are visiting, you need to stop by Bob’s Big Boy Restaurant. The famous burger restaurant was established in 1949 and in the early 90’s it was named a California Point of Historical Interest. We had wonderful meals at Olive & Thyme, a café and marketplace and Don Cuco Mexican restaurant, which are very good and not expensive at all. At Olive & Thyme, you can run into a celebrity or two, since it is a organic, fresh restaurant that serves salads and fresh made iced teas and much more. So, if you are in Los Angeles, be sure to give Burbank a chance, and go and explore at least the Studios that are open to the public and learn a little bit more about the history of this production city. Last Friday, Feb. 22, was the National Margarita Day and that – aside from making us crave some Margaritas – made us remember our trip to San Antonio, Texas, a city where we had many, big and very good Margaritas! Our favorite spots to sip on that delicious concoction of tequila, triple sec, limes and sugar, were Mi Tierra, Rita’s on the River and Café Ole. Of course, there are plenty more bars and restaurants in the city, which is the number one tourist destinations in the Lone Star State. The first stop for us after arriving at San Antonio was the Market Square, a mercado-like place with shops and little restaurants. One of them, a not-so little one, is Mi Tierra Café y Panaderia. It is divided in two main areas, a bakery, outdoor bar and all are heavily decorated with Mexican staples and it is open for breakfast, lunch, dinner and after hour snacks and drinks. If you want a true Tex-Mex experience, this is the place to be. You will tell by the wait time to get a table. Food is good, a little bit expensive for what they serve but the Margaritas are well worth it. It is definitely an experience that everyone must have when in San Antonio. One of the most popular places in San Antonio is the famous River Walk, with its restaurants, bars, hotels and beautiful scenery. Be warned, that spending time at the River Walk during the day is very different that at night. During the day, you can peacefully admire and explore the area, take in the sites, snap pictures, etc… at night, everything changes… The atmosphere changes as the day progresses… music gets louder, people get rowdy and there’s a lot of drinking. One of the nicest places to get your drink on, have a nice meal with normal conversation sound level are Rita’s on the River and Café Olé, which is the home of the 60oz Margarita. And yes, we had one and it was delicious! If you want to explore what’s in the city beyond the famous River Walk, you are in luck… San Antonio has a lot to offer and it is very close to other cities like Austin and the Hill County. But if you want to stay in SA, you definitely have to pay a visit to The Alamo. The so called Cradle of Texas Liberty is the site where 188 Texas defenders died in a battle against a Mexican army. The Plaza and the Church are filled with protesters, street performers and tourists. The best time to go visit is in the afternoon when it is not that crowded. If you are looking for more culture, the San Antonio Missions National Historic Park is what you need. Keep in mind that this is not a walking trail as the missions have 2 – 3 miles in between. The trail starts with the Conception Mission, one of the prettiest ones…. Espada is close second. However, the most popular is the fourth one, the San Jose Mission, which provides the most historical and architecturally interesting one. The story of the missions start with the Franciscan friars that walked all the way from central Mexico (yes, they walked!) to central Texas in hopes to build a community of God. If you have a sweet tooth or if you like breakfast, you can’t miss these two places: Lulu’s Bakery & Café and Magnolia Pancake Hause. In the first one, you can find the largest cinnamon bun that you could ever have! The restaurant, actually it is more like a diner, was featured in the Travel Channel’s Man vs Food show. Magnolia Pancake Hause was an unexpected find. The breakfast and lunch only restaurant is a family owned place that has been serving the best homemade pancakes since 2000, with recipes that are over 30 years old. Their World Famous Pancakes include the delicious bananas foster, apple cinnamon and bacon pancakes, yes bacon! As you can see, even though San Antonio is a Tex-Mex heavenly city, there is a lot to do other than to drink Margaritas, although we will drink them any time! One of the places that we included in our “Travel Bucket List” is Greece, specifically Athens and the islands of Mykonos and Santorini. And this year we are finally going to check it off!!! Amidst all the planning and searching for the trip of a lifetime – at least for us – we have started to crave Greek food. Reading about the freshness of the seafood, vegetables and the olive oil, has made us hungry for those dishes and we can’t wait to try them until we are in Greece… oh no, we need them now! So we started another type of journey, finding the best Greek restaurants in Central Florida. And the results have been fantastic! However, if you think that Taverna Opa, a chain restaurant with establishments all over Florida, was our number one pick, you are totally mistaken. Yes is on our list, but definitely not number one since there are others that are better – food quality and price-. One thing we learned, thanks to a special Greek/Dutch friend, was that if the restaurant has hummus in their appetizer list, it might not be as authentic as they sound to be. Hummus is not a Greek ‘mezze’, an appetizer… it is Mediterranean (Turkish, Lebanese, etc) but definitely not Greek. But in the good ol’ USA, hummus is found in almost every Greek restaurant. Another non-Greek item at restaurants, belly dancing… If there are belly dancers or a belly dancing show at any Greek restaurant, it is not truly Greek. There’s no belly dancing in Greece. There is music, smashing of plates and the famous Zorba the Greek dance, but definitely not belly dancing. So you have been warned! And what’s a true Greek mezze? Well, like we mentioned, it is a combination of appetizers – hot or cold -, similar to the Spanish tapas. They can include grilled octopus, pita bread, kalamata olives, fresh feta cheese (drizzled with olive oil and oregano), saganaki (a grilled cheese), taztziki (yogurt with mint and cucumber), melizanosalata (eggplant salad) and other meats like keftedes (lamb meatballs) or sausage. We got hungry just by explaining that! So here are our best finds! Hope you go on and explore your Greeky side, wherever you are! Of course, there are many more restaurants in Central Florida that are Greek and that serve Greek food. These are just a few ones that we know and learned to love.